It is a alpha hydroxy acid (AHA) that is derived from sugar cane. Glycolic acid is one of the best known AHA's and is used to smooth wrinkles, fade hyperpigmentation, sun damage and smooth the overall texture of the skin. It's molecules are very small and therefor can easily penetrate the skin, allowing it to loosen the bonds that hold the skin cells together, this is what makes it more effective at removing dead skin cells. The glycolic acid 35% gel peel is devised to stimulate collagen formation beneath the skin, improving fine lines and wrinkles. It is one of the minimum strength peels that only penetrates the epidermis (the top layer of skin. The gel will remove dead skin cells and smooth the skin leaving it brighter with fewer fine lines. As this is a professional strength peel it is very important to follow the directions correctly. I have summarized the lists below from the opinions of the people using the facial peel. Glycolic Acid (35%), deionized water, sodium carboxymethylcellulose, propylene glycol. Apply 2-3ml Glycolic acid to a gauze pad and apply to the face using a gentle rubbing action. Leave product on initially for 30-60 seconds, building up to 1-4 minutes as tolerance increases. Contact time should not exceed 10 minutes. Use every 5-7 days in conjunction with regular exfoliation and moisturization of the skin. Rinse area with water at any sign of redness or discomfort. If uncomfortable irritation occurs, discontinue use and consult your skin care specialist. Avoid contact with eyes and lips. Do not rub into skin. If contact occurs in eye, rinse thoroughly with water. The majority of ladies seem to find this peel very effective at improving the condition of their skin. They like how it reduces acne scars and breakouts and how it leaves their skin feeling a lot smoother. However, it is to be used with caution as it can be irritating and can even burn the skin if you are very sensitive or it is left on for too long! Some ladies found it was too strong for them and caused burning or scabs. 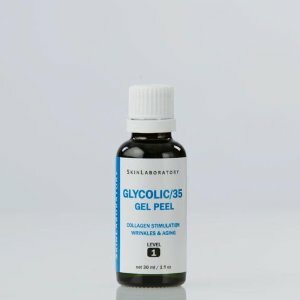 If you are not sure if how it will effect your skin, I suggest starting with a 10% glycolic peel and see how your skin fairs. It is quite reasonably priced at $18.95 for a 30ml bottle, it does usually cost $34.95, which is still not a bad price considering how much you pay for peels at the spa. 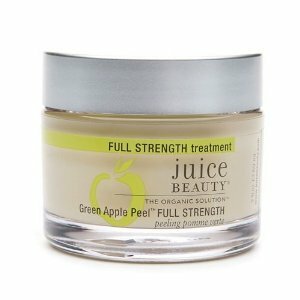 Juice Beauty Green Apple Peel full strength facial peel is made with all natural organic ingredients. Using organic fruit juices and cane sugar Juice Beauty says this peel will leave skin smooth, looking brighter and even. As a lot of you will probably know I love natural products. Just to warn ladies with very sensitive skin, because this does contain acidic fruit juices it may be irritating to some of you and make skin feel quite dry. Some ladies from totalbeauty.com say it does work making the skin smoother, softer and less oily. Although one lady did say that the results don't last long. Others just think it is a bit too harsh, especially for sensitive skin. A few people found it made their skin red and a couple even siad it felt like it was burning their skin. Organic Hydroxy-A Juice Solution Of Pyrus Malus (Apple) Juice (Malic), Citrus Medica Limonum (Lemon) Juice (Citric) & Vitis Vinifera (White Grape) Juice (Tartaric), Organic Raw Cane Sugar (Glycolic), Salix Alba (Willow Bark) Extract (Salicylic), Organic Milk Peptides (Lactic), Organic Aloe Barbadensis Leaf Juice, Glycerin, Hydroxypropyl Starch Phosphate, Sodium Hydroxide, Organic Algae Extract, Sclerotium Gum, Tocopheryl Acetate & Tocopherol (Vitamin E), Ascorbyl Palmitate (Vitamin C), Retinyl Palmitate (Vitamin A), Phospholipids, Magnesium Aspartate, Zinc Gluconate, Copper Gluconate, Phenoxyethanol, Benzyl Alcohol, Potassium Sorbate, Tetrasodium Edta, Xanthan Gum, Azulene, Citrus Reticulata (Mandarin), Litsea Cubeba (May Chang) & Cinnamomum Camphora (Ho Wood) Pure Essential Oils. The reviews are quite mixed with this one. Some found it made their skin really smooth and less oily. While other users though it was too irritating for them. Ladies with less sensitive skin may want to give this peel a try if you don't mind forking out $39 for a 2oz jar.